On a cloudy and (dare I say it, coming from my usual walking in Melbourne!) wintry day in Brisbane, am up visiting friends over the school holidays, one of whom is Dianne McLay, the author of Brisbane’s Best Walks http://brisbanewalks.wordpress.com/. Di and I have walked together over more years than we care to remember, in many countries and in all sorts of weather. So a wander around one of her walks with all our kids in tow seemed a good way to burn some energy and warm up. 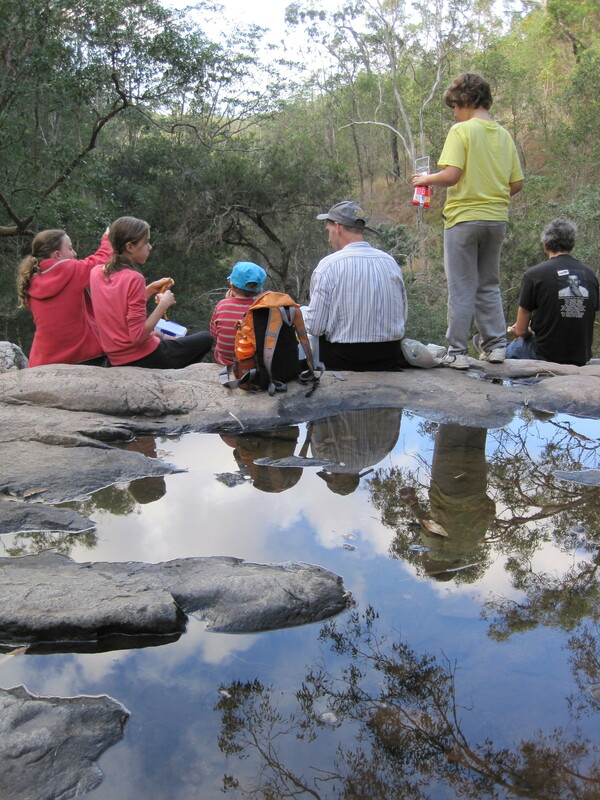 We headed for one of her family’s favourite walks, the Mt Coot-tha – Slaughter Falls circuit, which starts from the Grey Gum car park along the main Mt Coot-tha ridge. This walk has a bit of everything – views, ups and downs along interesting paths, wildflowers, gullies, creeks and a strategically placed rock-strewn waterfall about two thirds of the way along for a great rest and refreshment stop. It’s a wonderful feeling to be so close to the city yet truly feel like you are miles away in the bush. After a fun, scrambly detour to explore the mostly dry but beautiful water course below the waterfall, we headed back to the Summit for that panoramic view across the city as the sun was setting. What a fantastic day!